I think this is the first time I’ve bought pork chops before. I wasn’t really sure how to cook them – possibly use one of those griddle pans? I don’t own one of those so I used a frying pan instead. But before the chop could hit the pan I needed a sauce to go with it. Perhaps a separate post on creating a barbecue sauce is in order! I mixed this in a bowl then coated all of the pork chop in the mixture. I then added a splash of oil in the frying pan and began to fry it on a medium heat. I then chopped a pepper, potato, broccoli and added it to the leftover mixture and fried all of this too. After 10 minutes I turned the pork chop over which had this lovely charred effect all around the sides. After five minutes it was done and added rice. The flavour wasn’t as strong as I thought it would have been, but that turned out to be a good thing. The sauce didn’t overpower the juiciness of the pork chop, particularly the fat which oozed with every bite. I’ll try marinating the pork chop to see if the sauce will seep into it. I’ve also found this useful article about cooking pork chops! It mentions taking the pork chops out of the fridge so it reaches room temperature, cutting small slits into the fat so it doesn’t buckle (which mine did), rubbing salt and pepper into it and cooking it separately from the sauce. Do you have a good recipe for sticky barbecue sauce? 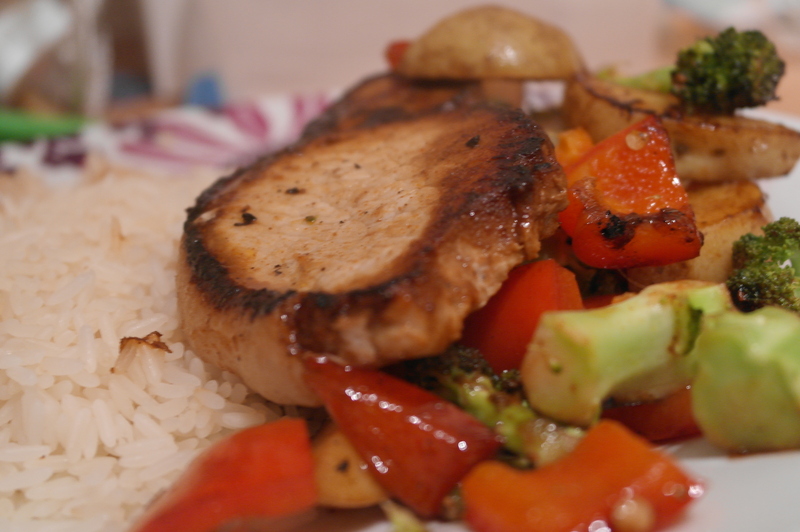 Do you have any tips for cooking pork chops? Tell me in the comments section below!